How amazing is it to have a four day weekend? I really wish that every weekend could be like this, I've always thought that two day weekends aren't long enough, I really appreciate having the time to sleep, chill out, go on adventures and do boring things like housework. A normal weekend just doesn't give you enough time to do all of that. I hope you are all having a great break. 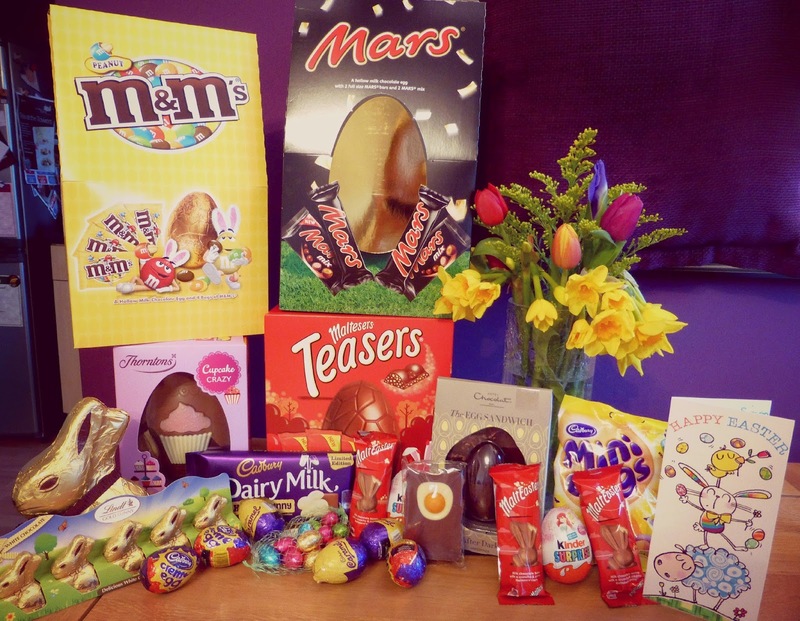 I'm so excited that it's finally Easter Sunday, as you can see we may have over done it with the Easter treats. Simon surprised me by getting me a Thorntons egg, a Malteser egg, a Dairy Milk Hoppy Bunny and, my personal favourite, Disney Princess Kinder Eggs. I'm so excited to discover what toy I might get, Ariel is on the wrapper so I'm hoping for something Little Mermaid themed. We also managed to pick up a few free Easter bits with our O2 Priority Moments - a mini fried egg slab from Hotel Chocolat and a net of eggs from WH Smith. I then got a few other things from the supermarket to fill up the fridge, just because I like to make sure that I've tried one of everything. I couldn't help but get a giant dark Lindt bunny, some mini white Lindt bunnies, Cadbury's Crème Eggs, Caramel Eggs, Mini Eggs and Malteaster Bunnies. Then just when we thought we possibly couldn't have any more chocolate Simon's Mum bought us an Easter egg each. To finish off I bought a couple of packets of Hot Cross Buns from M&S. They have the most amazing flavours there so it was hard to choose which to get but in the end I went for Belgian Chocolate and Toffee and Apple. Don't worry, we don't plan to eat all of this at once, chocolate tends to last quite a while in our house and we are currently still working our way through Christmas chocolate. The flowers were a beautiful Easter Posie that I picked up from Tesco for £3.00. They looked beautiful in the shop with all the different coloured Spring flowers. Unfortunately as soon as I got my hands on them they didn't look the same. My flower arranging skills are horrendous. We've spent all of today in the cinema for a proper chill out session, we managed three films in a row and I took a little box of Easter treats to keep myself going. I hope whatever you did today you had a great time with your loved ones. I know, we look so greedy ... and we probably are because how can I deny it with that photo looking at me! 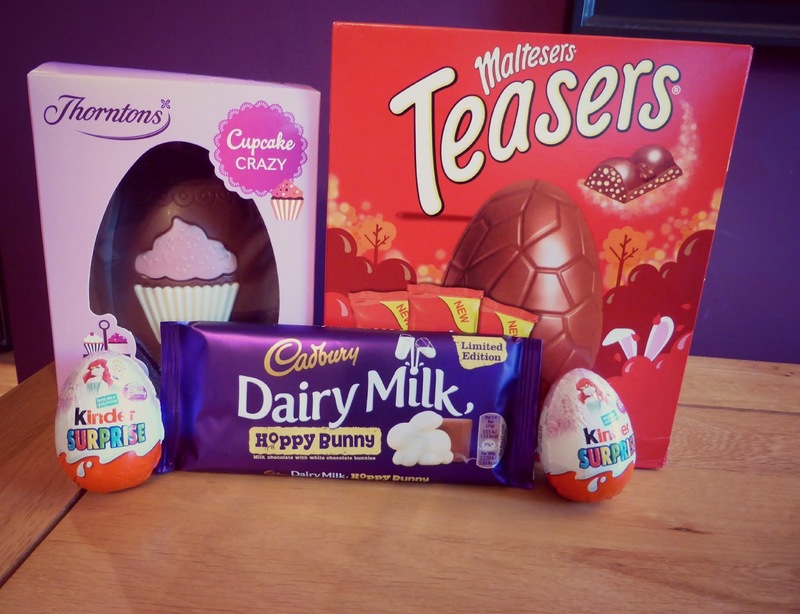 I just love all the Easter goodies and like to partake in a bit of all of them! We struggled to find caramel eggs too, in the end we had to go to Pound Land! Wow that is a lot of eggs - I don't think I got that much as a child lol. Eggs aren't really a big thing here in the US, more about peeps or decorating real eggs or you get chocolate in the shape of crosses and such. I went to Australia one year over Easter and they were MAD on the chocolate over there, every shop was full of so many chocolate eggs, just shelves and shelves of them, and so many chocolate Easter bunnies too, our eyes were on stalks! Oooooooooooh the cranberry and orange were in my hands at one point, there were 4 packs I was trying to choose from, I decided that buying all 4 might be a little too greedy even for me! I highly recommend the M&S hot cross buns, they were so so tasty! How awesome! What films did you see? And what did you think of them?